Let's look at Side B tracks to the 'WHATDOYOUTHINKYOUKNOWABOUTDEEPHOUSE Vol. 1 - Attitude' EP. 'Months of Mays' is a refreshing collaboration with the legendary producer Harry Dennis of the Chicago, part of the group 'The IT' which he formed with Larry Heard and Robert Owens. The track is a throwback to Dennis' signature spoken word and the mid-tempo rhythms of 80s Chicago house music. Part of the 4th installment in the 'Spaces & Places' series, 'New Rivers' is a fitting tribute to the numerous new rivers crossed in distant lands. From the forthcoming EP 'WHATTHEFUCKDOYOUKNOWABOUTDEEPHOUSE Vol. 1 - Attitude', 'Wet' is a hypnotic deep house track which entices you with its seductive organs, coming soon to a record store near you. Written, produced and performed by Ron Trent for MUSICANDPOWER (MAP010), additional vocals by Hsiao-Lan Liu. Happy Friday people! Celebrate the Summer vibes with the MUSICANDPOWER Online Digital Store Summer Sampler. All tracks are available from the digital store at www.gumroad.com/musicandpower either in MP3 or WAV format. If you can't decide and just need to have them all, you can get the 'MUSICANDPOWER Summer Digital Vol. 1', which contains all 7 tracks from the MUSICANDPOWER Online Digital Store in either MP3 or WAV formats. Join Ron Trent in discussion following the strange trend of white dance-music DJs who pass themselves off as black artists. The European producer Guy Tavares chimes in from The Netherlands on what he sees as overhyped controversy. Piotr Orlov, who covers dance music for NPR weighs in on what this all means for music fans. Click below to listen to the show. This topic was inspired by the article from Thump Magazine 'When White Producers Co-Opt Black Identity', published 27th October 2016 and of which can be read here. Another addition to the Dancefloor Boogie Delites album, "I Just Wanna Dance With You" first premiered on the Japanese DJ show Dommune. Now this highly sought after Jazz Funk selection is now being made available for your play exclusively from MUSICANDPOWER. Less than a few days to go, Detroit peeps! Make sure you don't miss this very special occasion in celebrating 40th anniversary since the doors of the Warehouse opened in Chicago and changed the music world forever. This photo of my cousin Lee Collins and Frankie Knuckles taken by me captures one of the moments I always recant. When I am interviewed most times the subject of FK or my favorite sound systems come up. This photo has both of these subjects behind it. In the booth with Frankie as he was embarking upon musical journey during his Saturday night residency. Those of us that followed Frankie knew that he was a master at creating moods and presenting his sentiment in his style. There was a level of sophistication and higher learning in the way Knuckles delivered his sound. it aligns "YOU". The thing that keeps most from this is their own lack of openness and humility. When I was learning and coming into my own as did others, you had no choice but to be humbled in the presence of the experience, be it a person or a moment. This is where many miss the point. This is how you learn and receive the components of mastery. how to reach for that ethereal wonder that we call music. Check out Ron Trent's latest release 'BPS Dub' on his longtime hero Don Lett's radio show 'Culture Clash Radio - Crucial Cody Chestnutt' on BBC Radio 6. Click here to listen to the show now. A big thank you to those to turnt up (yes...TURNT UP!!) at Robert Williams Birthday Celebration last Saturday. We all had a blast and it was an honor to host such an event for Mr. Williams who has been such an inspiration. We made sure all of the elements were in place to remind us of how he set the tone for Chicago underground clubs: from the juice bar, fresh fruit; down to the selections of Ron Trent, Lee Collins and Duane Powell. Big up to Elastic Arts also for letting us have a space to create such a special event. Last but not least, it was a historic night marked by our guest, Mr. Nicky Siano, who stayed in Chicago especially to play for Mr. Williams' birthday. Historic because it was the first time a NYC peer of Mr. Williams played for him, an event that is way overdue considering the contributions both of them gave towards the world of underground and commercial club culture. Ron Trent releases his latest Music And Power online exclusive track, 'Melting Pot Presents: The Master Plan Re-Edit 2017'. I sat down with the producer to talk about this new release. "Back in 2009, I released 'The Master Plan - Tribute to Obama' as a celebratory tribute to the man,", says Ron Trent. "It was a time of elation, a time for change." The release of the original tribute track came after the tumultuous 8 years of George W Bush in office that had seen the second Iraq war and the financial crisis. Obama's victory signified a new beginning, that a charismatic African-American man of integrity, known for his community activism, had become the Chief-In-Command. In his 8 years at the White House, Obama has proven his track record by bringing the US economy back from the red, establish the Affordable Healthcare Act and, with his wife Michelle, become role models whom people from all backgrounds aspires to around the world. As we see the Obamas leave the White House gracefully and enter a new life as civilians, what is the reason behind re-editing a track that harked back to the beginning of the Obama era? "I re-edited this track to symbolize the ending of Obama's two terms in office and leaving in grace", says Ron, "however our current president begins his term in chaos. Where he has been a successful businessman, I've never looked at him as a political figure. Coming from a Pan-Africanist background, I know that anything is possible when it comes to the world's politics and history not being on the right side of things. This piece of music represents a staff of historical pertinence and legacy, since art is supposed to be a representation of the pulse of the times and tell stories. I wanted to re-approach the track sonically with new elements to signify the revival of the track, and also represent elements of a march echoing the protests that we are seeing today". 'Master Plan Presents: Melting Pot Re-Edit 2017' is exclusively available through Music And Power online digital music store on Gumroad, to purchase the track in WAV format click here. Listen to one of the unreleased tracks "Black Magic Woman" featuring Harry Dennis, part of the Prescription Anthology from Rush Hour. I am writing to you today to thank you greatly for sharing such inspirational words on your CDR interview. I have been very moved by all the advice you shared on this and its given me countless encouragement to follow my heart and to create music with all the challenges life throws at you. I would have a pen. I would try to communicate and articulate with the best words that I could possibly use to get you to understand exactly where I’m coming from. Same things happens when you're creating. You find the best sound that will articulate where your coming from emotionally and you write that down with whatever instrument you have. And wanting to see it all the way through. My idea would be to communicate with these colours, my message or what I’m feeling at that time. Using your skill level as in terms of techonogly to be able to articulate that. I have something in my head, something in my heart and I put it down. Long awaited "Ron Trent presents – Prescription : Word, Sound & Power" is now available to pre-order from Rush Hour Store, a 6-LP box set celebrating the highlights of Prescription Records with classics such as 'Choice' and 'Morning Factory' aside some unreleased gems. Watch the below short film to discover more about the project in Ron Trent's own words and follow the link here for more information on the box set. Check out the latest release from the forthcoming 'Dancefloor Boogie Delites: 1982' album. Click here to listen to the sample, download in WAV here and MP3 here. Download the new release now, exclusively available for digital download here for only $7 in WAV digital format from Monday 3rd October until Sunday 16th October here. Ron Trent has been synonymous with the Afro Sound since the mid 1990s, as he is considered one of the pioneers of infusing Afro Beat into dance music. Growing up with a heavy influence of percussion in his music repertoire, the use of congas and hand percussion was second nature in his production. Spiritual Jazz, Blues Rock, Brazilian Jazz and Afro Beat were big proponents in Ron’s cultural upbringing. The likes of Fela Kuti, Roy Ayers, Jimi Hendrix, Miles Davis, and Azymuth to name a few, were artists from whom Ron Trent drew his influences. Coming from a Pan Africanist world -view prospect, Ron’s approach to music as a DJ and producer has always been rooted in the connection to Africa and the influence of diverse tributaries birthed from African music in the world. Around 1994 Ron started to incorporate his first instrument, the conga drum, into his productions. This led way to developing a specific sound of his own that he is known for today. Unconsciously pioneering the Afro House of today along with the likes of Timmy Regisford, Joe Claussell, Kerri Chandler, Jerome Sydenham, Masters at Work and Francois K., a movement was created. Fela Kuti, King Sunny Ade, Tony Allen, and Femi Kuti have largely been respected on the dance scene all the way back to beginnings of dance culture at the Loft with David Mancuso and further into the Paradise era. Playing Fela songs amongst a wide array of musical formulas was natural for the underground dance culture. Hearing a Fela song right next to Larry Heard or Santana were an elemental formula that DJs and dancers alike were open to. Ron started building a forum for African based sound with his party 'African Blues', which started in Chicago around 1995. He later brought it to NYC in 1997 for a special MKL celebration with DJ Joe Claussell and an additional live performance by Jephté Guillaume and Boukman Eksperyans, cementing Ron’s connection to presenting world music on a wider scale. By now, Ron also became highly regarded in the Japanese market for the Afro sound, using it in various forms of propaganda to promote Fela’s legacy. The very first launch party of 'Jump N Funk', spearheaded by Wumi, Debra Seely, and Rich Medina, was done with Ron Trent in collaboration with his weekly residency at Giant Steps sessions NYC, held at the Shine nightclub on West Canal Street. 'Jump N Funk' went on to being known as the party championing the conscience of Afro Beat and its founding father Fela Kuti. As post-9/11 aftermath affected the social climate of NYC, Giant Step Sessions were ceased in 2003. 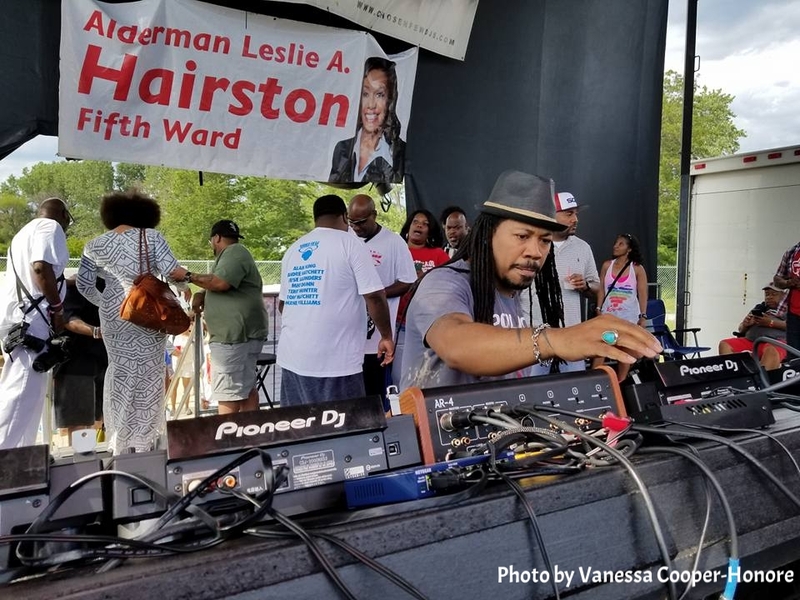 Ron then joined forces with Sonia Hassan to birth a new Afro Beat inspired event called 'AFRICA HI-FI', introducing a musical concept to Chicago that had not been present since Ron’s previous years with African Blues. With consistency, Ron and Sonia created a brand which elevated the awareness of World music and flavors from around the world, inspiring others to start events and produce music inspired from Fela and his Son and the sound that Ron helped spawn in previous years: the heavy driving rhythms, percussion and revolutionary spiritual vocals. Ron’s production work is reflective of his connection to the Afro Beat sound, notably his remixes and original work with Tony Allen, remixes for Seun Kuti’s 'Dem Eyes' and for the late great Papa Wemba. Various releases including DJ compilations started in 2000 with the release of 'Urban Afro Blues' on Nite Grooves and later 'Abstract Afro Journey', which were critically acclaimed “must haves”. Ron Trent has also been the opening DJfor several Femi Kuti shows since 2000 starting in New York. This story continues to be written as there is host of many things to come, with more events and music connecting the dots.